Beier Machinery is specialized in providing you with PE Bottle Recycling Line which is specifically used for recycling,crushing and cleaning waste PE bottles and other PE plastic bottles. Regarding PE bottle recycling, one of the main application is surely blow molding application, as this became for the investors one of the most important final applications in terms of investment returns and of positive results. The most common applications of PE bottle are milk and food containers, detergent bottles, body care as shampoo bottles, and motor oil bottles. PE is also used for PET bottle caps. In this section, Beier Machinery can process PE recyclable products like PE post consumered containers, pipes, other blow molding applications. 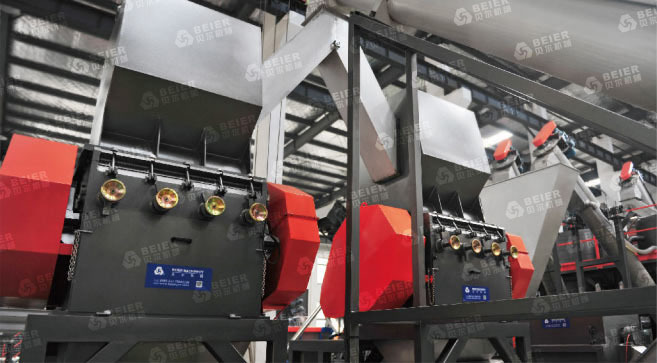 Beier machinery PE Bottle Recycling Line is consisting in sorting prewashing, wet grinding, hot washing, separation, centrifugation and drying. Then it can be conveied to Beier Machinery pelletizing system for further recycling process. This series PE Bottle Recycling Line is widely used to recycle waste PP woven bags, PE Plastic film,plastic bags, plastic garbage, waste plastic mulch film. We can use them to be granules which is after crushing washing and drying.This PE bottle recycling production line is high automatic operating and save labor cost and low after maintenance.